Encourage all your virtuous dispositions, and exercise them whenever an opportunity arises, being assured that they will gain strength by exercise as a limb of the body does, and that exercise will make them habitual … Give about two [hours] every day to exercise; for health must not be sacrificed to learning. A strong body makes the mind strong. As to the species of exercise, I advise the gun. While this gives a moderate exercise to the body, it gives boldness, enterprize, and independance to the mind. Games played with the ball and others of that nature, are too violent for the body and stamp no character on the mind. Let your gun therefore be the constant companion of your walks. Never think of taking a book with you. The object of walking is to relax the mind. You should therefore not permit yourself even to think while you walk. But divert your attention by the objects surrounding you. Walking is the best possible exercise. Habituate yourself to walk very far. The Europeans value themselves on having subdued the horse to the uses of man. But I doubt whether we have not lost more than we have gained by the use of this animal. No one has occasioned so much the degeneracy of the human body. An Indian goes on foot nearly as far in a day, for a long journey, as an enfeebled white does on his horse, and he will tire the best horses. There is no habit you will value so much as that of walking far without fatigue. I would advise you to take your exercise in the afternoon. Not because it is the best time for exercise for certainly it is not: but because it is the best time to spare from your studies; and habit will soon reconcile it to health, and render it nearly as useful as if you gave to that the more precious hours of the day. A little walk of half an hour in the morning when you first rise is advisable also. It shakes off sleep, and produces other good effects in the animal economy. There are many excellent lessons that can be derived from this short passage. You will often hear me say that we should "look to the past to prepare for the future". This excerpt represents exactly what I mean. Thomas Jefferson does the same thing when he mentions their use of the horse. Our lives necessitate the use of automobiles. There is no argument there. But what we do outside of the daily routine of our employment and errands can incorporate what our ancestors advised. Do we spend too much time playing, or even worse, watching sports? We love to get away and enjoy the mountains but do we walk or hike, bike, or ride our atv's? I have never enjoyed power sports much. Riding a noisy, stinky, and potentially dangerous four wheeler never made much sense to me in the quiet beauty of the outdoors. I guess it depends upon your purpose for being there. Personally, I'd much rather work on my own health, both physically and mentally, than maintaining and paying for a machine that has a short usable life span that can shorten my own. I've never been fond of running when it comes to daily exercise. It is hard on the body and just isn't much fun. In an emergency it makes perfect sense to me. To be able to sprint away from immediate danger is an essential life saving skill. Running down a mountain trail is something that I have done often. It is important to be able to run to the shelter of a cabin, tent, or vehicle away from a coming storm or dangerous situation. Running on a trail is much different than on pavement. It requires a more alert mind and attention to surroundings. I have always believed that a fast walk is more beneficial to our bodies than is running over long distances. I don't often let others around me know, but when I am walking or hiking or the like I almost always have my handgun on me. What I mean is that I very rarely am without it. When I am swimming with my family at the public pool I obviously do not have it with me. Other than that you can pretty much expect it. I think many others might expect that when I am purposefully walking or otherwise exercising that I would leave it behind because of comfort or it getting in the way. Nope. I don't usually see a reason to leave it behind. Yes, this means that I have an array of different holsters to carry it differently depending upon how I dress. I also have a few different options as to which handgun I carry. 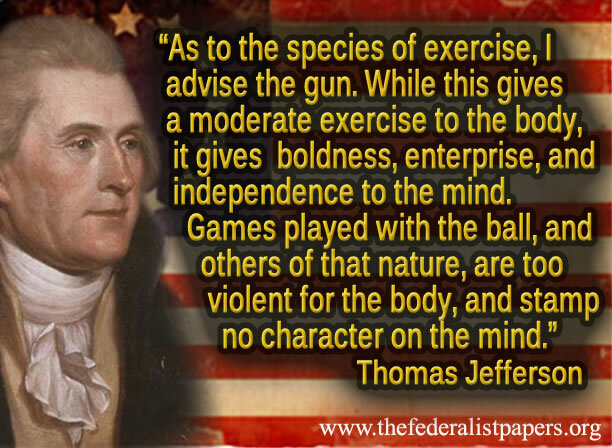 Thomas Jefferson described this as providing boldness, enterprise and independence to the mind. What an interesting concept! Exercising the body and mind at the same time. Who would have thunk that carrying a gun while exercising an excellent way to accomplish both? In a day and age when efficiency and multitasking is the norm and "time is money" how have we gotten away from this practice? Too often I see people out for a walk or running with headphones. I assume listening to the stimulating beat of quality music. I love music! I love finding new music and the way good music makes me feel. Music is an important part of my life. However, I believe that Mr. Jefferson's advice to never think of taking a book, to relax your mind and not permit yourself to think but to divert your attention to things around you is inspired advice. Combining moderate exercise with mild stimulation to the mind is probably a good idea. Step away from the devices and screens and allow the mind to heal along with the body. Do you carry a firearm with you everyday? If you do not, then you may not understand why my buddy Thomas wrote these things to his nephew. I think I do. When I first got my concealed carry permit I was too timid to carry. Especially with a round in the chamber. I slowly began carrying occasionally but felt very self conscious. Over time and with more and more experience and training I gained confidence to carry chambered daily and have made many decisions of what I would do if placed in various situation. This is a simple and basic illustration of the boldness, enterprise, and independence that I have gained from carrying a gun. 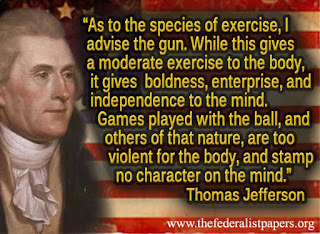 As I continue with this practice, and extend my experience to carrying a long gun over my shoulder as appropriate, while now being aware of Thomas Jefferson's advice, I am anxious to find out what I might learn next.